THE continuing dry conditions experienced in the region have led to an increase in stock movement permit applications. 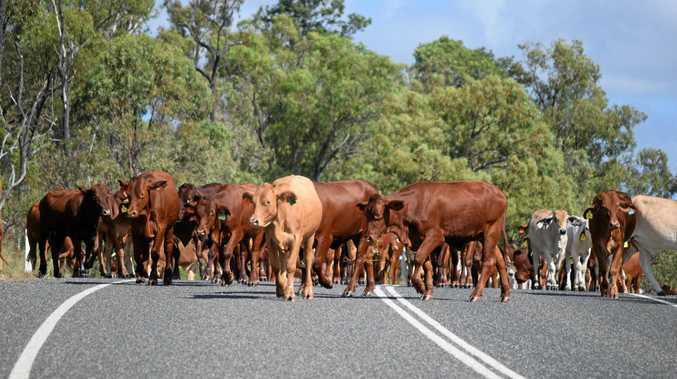 North Coast Local Land Services are reminding road users and North Coast farmers to be aware of the requirements relating to stock on roadsides and of the importance of Cattle Ahead safety signs. "With the school holidays commencing we are expecting lots of holiday-makers to be out on our roads and we're encouraging road users to be aware of livestock on the road and drive accordingly," Land Services officer for Travelling Stock Reserves, Gabrielle Blackwell, said. Roads and Maritime Services encourages drivers to be aware that when they see a sign with a picture of an animal, or words such as 'stock crossing', they may be approaching animals on or near the road. They also advise drivers must slow down or stop to avoid crashing with livestock and fines apply if signs are not obeyed. "By paying attention to the signs, drivers will be aware that cattle are present on the road and will slow down, not only ensuring the safety of the cattle, but more importantly their own safety," Ms Blackwell said. Farmers should contact North Coast Local Land Services before they plan to move stock or for information on the requirements for using stock warning signs.